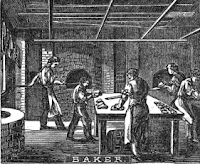 "Mrs. Goodfellow was a very respectable, ladylike person, who, having been thrown on her own resources, opened a pastry cookery establishment, which soon became famous.” From at least 1801, she was listed in the city directories as Eliza or Elizabeth Pearson, pastry cook, then as Eliza Cone. After Coane died, she married William Goodfellow, a Philadelphia clockmaker in 1808 when she was 40, but he too died, ten years later. She had two children - Sarah Anne Pearson Bouvier (1800-1826) from her first marriage, and from the second, Robert Coane (1804-1877). “Betsy Goodfellow, [was] a famous maker of cakes and pies at that time.” Many of her baked goods were legendary, particularly the "excellence of her cakes." According to city directories Mrs. Goodfellow moved her shop several times in over five decades: 64/68 Dock street “near Second street, south side,” 134 South Second, and finally 91/71 Sixth Street “between Spruce and Pine Streets.” She also changed her job title. For thirty-five years and at the three locations, she was a “pastry cook,” then she became a “confectioner” in 1837 and the shop was renamed E. Goodfellow & Son (she was 69, Robert 32). When she personally was no longer listed, by age 80, the store became Goodfellow & Coane. Generally she was listed as Elizabeth over the years, except the four years she was Eliza Cone, and once, when she appeared as Eliza Pearson in the listing and Elizabeth in the index of the 1801 directory. She may have been working or owned a shop before 1801 (actually 1800 since they collected the data the previous year, when she was about 33 years old) but several years are not currently online. Miss Leslie would gain fame and financial security stealing/using Mrs. Goodfellow’s recipes and techniques, as the foundation for her first cookbook. She mentioned her teacher in a few later books – although tellingly, not in the first one, and didn't write that she was her student until after Goodfellow had died. Furthermore, she had her first book published in Boston rather in Philadelphia where they both lived, and where her brother-in-law Henry Charles Carey was a book publisher. In fact, Eliza Leslie insisted in the introduction that the recipes were "original, and have been used by the author and many of her friends with uniform success." But it is from Leslie's later remembrances, and others, that we know about the work of Mrs. Goodfellow. Scattered bits of information adding up; judging by the length of this post in my 'American women cookbook authors' series. Eliza Leslie’s recipes in her first book Seventy five Receipts for Pastry, Cakes, and Sweetmeats, were mainly from her two terms with Mrs. Goodfellow. Two years later a recipe for Mrs. Goodfellow's Lemon Pudding was among the American recipes added to a Philadelphia 1830 edition of MacKenzie's Five Thousand Receipts... After she died, a competitor, Elizabeth Nicholson, included “Goodfellow's Spanish Buns.—(Original Receipt. )” in her 1856 cookbook, and the buns and Goodfellows Jumbles also were in Scott’s book, 1866. These and other cookbooks with recipes are listed at the end of the post. (Mrs. Goodfellow’s) Cookery as it Should Be – don’t blame the author! BUT. People in glass houses….. Leslie (whose recipes I like and sometimes make) had a huge following and earned praise and money (she spent much of her last decade living as a celebrity in the United States Hotel) from her many cookbooks, and had, if we are frank about it, 'borrowed' recipes and ideas from Goodfellow in that first book of 75 recipes and later ones. This was not unusual. Some she had updated. For all the complaints that the new 'Mrs. Goodfellow' book used alkalis, which was counter to “the use of soda and other alkalis being unknown in the establishment” of Mrs. Goodfellow, Eliza Leslie used them also…even in her first book, where more than a few of the recipes called for pearl-ash or salaeratus. 6 Leslie, Eliza. Directions for Cookery, in its Various Branches. Phila: Carey & Hart (1837) in 1851 revised ed. 16 Norfolk Advertiser. July 27, 1832.